Congenital or early-onset disorders of the nervous system have a profound and lifelong impact on the lives of children and their families. 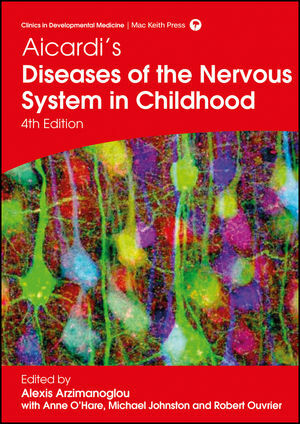 Diseases of the Nervous System in Childhood provides up-to-date information on the full range of these neurological disorders, from fetal and neonatal neurology to adolescence. Movement disorders, epilepsies and seizure disorders, metabolic diseases, auditory and visual disorders, and genetic anomalies are among the many topics covered in this text. Extensive reference lists at the end of each chapter guide the clinician to further relevant reading. This fourth edition retains the patient-focussed, clinical approach of its predecessors. The international team of editors and contributors has honoured the request of the late Jean Aicardi, that his book remain ‘resolutely clinical’, which distinguishes Diseases of the Nervous System in Childhood from other texts in the field. Alexis Arzimanoglou is the Director of the Paediatric Epilepsy and Functional Neurology Department at the University Hospitals of Lyon, France and Visiting Professor at the Universitat de Barcelona, Spain, coordinating the Epilepsy Research Program at the Hospital San Juan de Dios. He trained in Neurology at Great Ormond Street, London, UK and at the Hôpital de la SALPETRIERE and in Child Neurology as a fellow of Jean AICARDI at the Hôpital des Enfants Malades in Paris, France. He then with worked with Jean Aicardi for over 25 years. He served as Chair of the Scientific Committee of the European Paediatric Neurology Society, elected member of the European Commission of the International League Against Epilepsy (ILAE) and President of the Société Européenne de Neurologie. He is currently as International League Against Epilepsy Ambassador for Epilepsy for the ILAE, Editor-in-Chief of the ILAE Educational Journal, Epileptic Disorders and Associate Editor of the European Journal of Paediatric Neurology, official journal of the European Paediatric Neurology Society. He is the author of two books, editor of seven and an author or co-author of over one hundred scientific articles. Anne O'Hare is Professor of Community Paediatrics and Director of the Salvesen Mindroom Centre for Learning Difficulties, at the University of Edinburgh, UK. She is a developmental paediatrician with extensive clinical experience in neurodisability, neuroscience and child protection. Her research interests include how neurodevelopmental conditions impact on the development of speech, language, communication, motor skills and learning and the development of effective interventions. She has co-edited and contributed to numerous book chapters and articles in her field. Michael Johnston is Professor of Neurology, Paediatrics and Physical Medicine and Rehabilitation at the Johns Hopkins University School of Medicine and the Chief Medical Officer and Blum Moser Endowed Professor of Paediatric Neurology at the Kennedy Krieger Institute in Baltimore, Maryland, USA. His clinical and research interests include fetal and neonatal neurology, as well as care for older children with cerebral palsy and neurogenetic disorders. He has received the Bernard Sachs award from the Child Neurology Society and the Frank Ford Lecture Award from the International Child Neurology Association (ICNA) as well as the Jacob Javits Neuroscience Investigator Award from the National Institutes of Health. Robert Ouvrier is Emeritus Professor of Child Neurology at the University of Sydney, Australia. After training in general paediatrics in Sydney, Perth and Papua-New Guinea, he undertook specialist training in child neurology at the Royal Children's Hospital, Melbourne, the University of Kentucky (1969-70) and the Johns Hopkins Hospital, Baltimore USA (1971-72). He was Head of the Department of Neurology at the Children's Hospital at Westmead, Sydney for 25 years. In 1999, he became the Foundation Head of the Institute for Neuroscience and Muscle Research at The Children's Hospital, Westmead. He was President of the International Child Neurology Association from 2006-2010. He is the author of two books, 30 book chapters and an author or co-author of over 150 scientific articles on paediatric neurology.